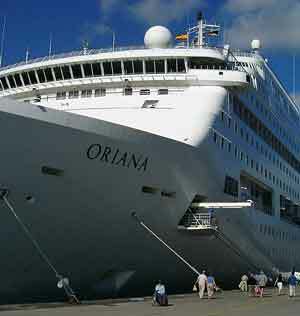 We have made three 10 night return New Year cruises from Southampton to the Canary Islands, two on the 69,000 ton P&O ship Oriana, one in December 2004 and the other in December 2010. The third was in December 2014 on the Arcadia. We celebrated New Year on board on all these cruises. We made the 2004 booking direct with P&O but our 2010 and 2014 bookings were made via a travel agent. All bookings were made over a year in advance to insure a good discount and to secure a suitable wheelchair accessible cabin. For all these cruises and for convenience, we drove to Southampton. This enables us to carry all the disabled equipment we require and you can drive right up to the ships, unload, and hand your car over to the local services to be parked for the duration of your trip. There is a parking charge but if you off set this against the alternative cost of public transport that you would otherwise have to pay, the price is well worth it. P&O offer assistance with embarkation which you request at the time of booking and this is most useful when you have hand baggage to carry aboard as well as push a wheelchair. There is a dedicated check in desk for the disabled. P&O provide information prior to sailing about port accessibility and the opportunities for the disabled to undertake local tours. This enables more effective planning for the cruise and helps us decide what equipment to take along for shore excursions. As previously experienced, the food and service were good and all dietary needs can be met if they are given notice of requirements before sailing. The 2004 cruise went to Santa Cruz, La Palma and Santa Cruz, Tenerife in the Canary Isle via La Coruna and Madeira and returned via Lisbon. 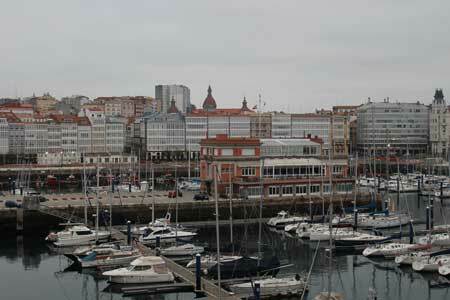 La Coruna, Northern Spain - We last visited Coruna in January 2015 on the way back from the Canary Islands. The town is built on a peninsula and ships dock within easy walking distance of the town and it is not that difficult to get about to shop or simply stroll along the well made up cycleway along the sea front. There are plenty of dropped curbs and the oldest lighthouse in the world, the Hercules Tower is located at the tip of the peninsula and is about a 45 minute walk away along the front. It is a pleasant spot to pass the time and you can return to the port alongside the opposite side of the peninsula, cutting through the town to cross the peninsula for the last half mile. This is total round trip of about 4.5 miles. This is probably to far for most but a very much shorter walk is to walk directly through the town, no more than half a mile, to the sweeping bay of the Orzan and Riaza beaches. At the southern end, near the sports stadium, there is an excellent cafe which overlooks the full sweep of the bay to the Hercules Tower. 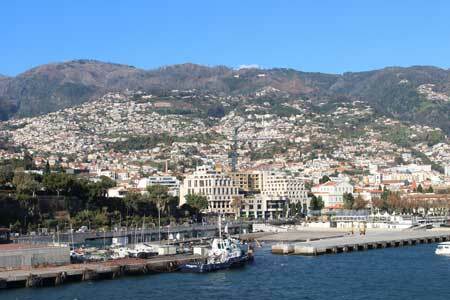 Funchal, Maderia - Funchal is one of our favourite ports of call. We last visited in January 2015. Ships dock opposite the town and it is about a 20 minute walk to Funchal's main frontage and main street. It is an interesting walk once out of the dock area. 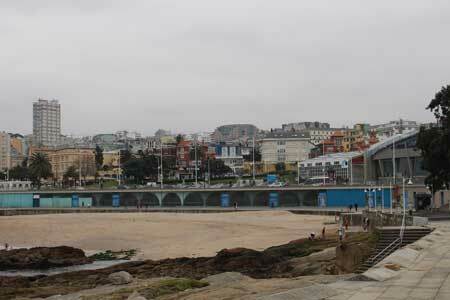 There is an incline out of the docks, then a level walk along the sea front past numerous cafes. Alternatively there is a wheelchair friendly shuttle service usually provided. Once away from the seafront there are inclines up into the back of the town which progressively get steeper the further back you go. There is cable car ride up to the heights above the town and this is wheelchair friendly but once you alight at the top it is not easy to get around the locality. However, it is worth the ride and there is a convenient cafe at the top from which to admire the view. Hop on and off open top buses are also available if you want to travel further afield but we have not used these although they are wheelchair friendly. If you are there for the New Year celebrations there is a magnificent firework display at midnight and the Christmas lights and decorations put the Blackpool illuminations to shame. 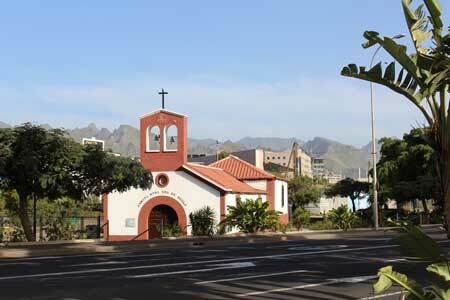 Santa Cruz, La Palma Island - One of the smaller islands of the Canaries which we visited in 2005. Again it is an easy walk into the small town from the dock and the single main street and the sea front provide the most interest although there is small fort which is worth a visit and from which there is a pleasant view. 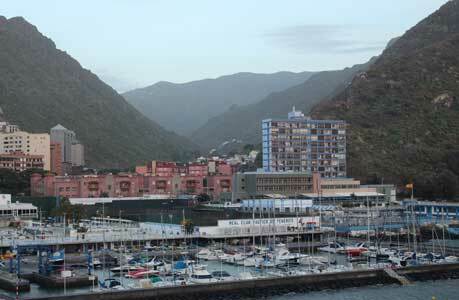 La Palma, Gran Canaria - We visited here on our 2010 cruise. It is an easy level walk from the port into the town and the beaches. A hop on and off open top circular bus tour of the town is available from just outside the port for about 15 euros each. The lower deck is accessible to wheelchair users. 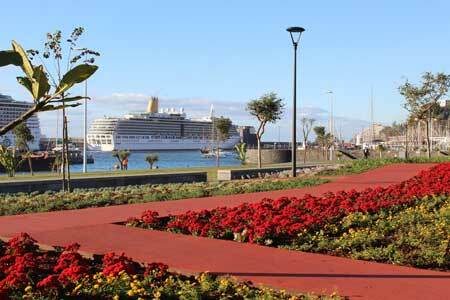 Santa Cruz, Tenerife - In addition to a two week holiday taken in Tenerife which you can read about here, we have stopped at the port of Santa Cruz on three occasions the last in January 2019. It used to be about a 20 minute level walk to get out of the dock area and then you were in the town's main square which fronts the harbour. In 2019 the ship docked at a new berth and terminal building which has made access to the town much easier. The main shopping area slopes upwards back from this square or you can walk in either direction along a level sea front promenade which overlooks the docks. Again there is a hop on hop off open top bus service for circular tours but we have not used. Alternatively if you fancy a small excursion there is a wheelchair friendly, modern tram service available to the interesting old capital of Laguna. Its a journey of about 5 miles and takes about 20 minutes. Lisbon, Portugal - In addition to visiting Lisbon on the Canary Isle cruises, we have also visited the city on cruises in and out of the Mediterranean, This port is not one we particularly enjoy but our last visit in July 2014 was made much better in that the ship docked closer to the centre and while a shuttle service was available to the City centre via a wheelchair friendly adapted vehicle, we chose the easy walk of about half a mile along the level sea front to the main square and shopping area. It is relative easy to get about this area but stray too far away from this and the terrain becomes more difficult. There is a wheelchair friendly hop on, hop off tourist bus service available which would enable travel further afield but we did not use it. We also noticed the availability of the Indian style “Tuk Tuk” taxis which may offer some with collapsible wheelchairs the opportunity of a bespoke tour further afield. P&O offered a wheelchair friendly tour in this port which we did not use. Vigo, Northern Spain - Our 2010 cruise called into Vigo on the way home. It was a Sunday, nothing was open and it was a miserable rainy day so we decided not to go ashore. The port is close to the town centre but that is all we observed. 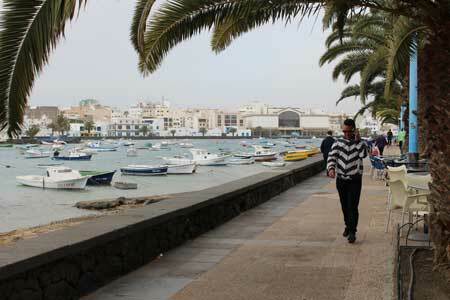 Arrecife, Lanzarote - The ship docks about 2 miles away from the centre of town but there is a wheelchair accessible shuttle bus service available should you not wish to walk along the coastal path. The coastal path looked an interesting walk with some inclines. However, we chose to use the shuttle bus service. 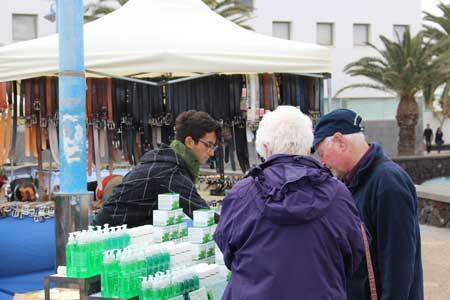 The interesting parts of the town are the sea front and the main traffic free shopping areas. Apart from this there is little point in walking deeper into the town which, in the main areas, is easy to get around.